This fiber-rich, low-fat Meatless Monday Recipe is a colorful combination of stacked rings of grilled vegetables, part-skim mozzarella cheese, and fresh basil. Start by preparing a marinade of honey, salt, pepper, olive oil, chopped garlic, and red wine vinegar, and let the sliced vegetables soak for 20 minutes. Grill the eggplant, squash, zucchini, and onion for 3 minutes per side, and the tomatoes for 30 seconds per side. Make four stacks by starting with the eggplant, then adding each vegetable and mozzarella, then repeating the pattern. Top with fresh basil. The meaty textures of eggplant, zucchini, yellow squash, tomato, and onion will keep you full and satisfied, and grilling the vegetables adds an extra burst of flavor. 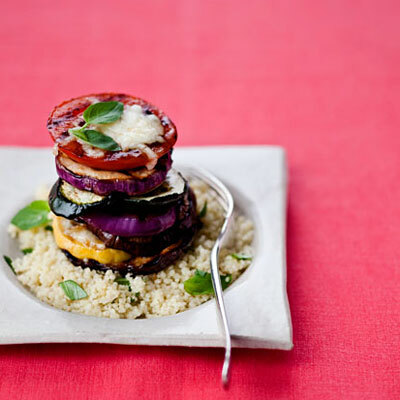 Serve the veggie stack over a bed of couscous for a total of only 309 calories per serving. Couscous can also be swapped for other grains, such as brown rice or protein-packed quinoa. Don’t have an eggplant or zucchini on hand? Swap out or add a variety of other vegetables, like sweet potato slices or butternut squash. Throw a lemon slice on the grill and squeeze on top of the stack for an added zest of flavor.